Buy the Farm . . . Share: Hats Off To Babies! Last night went surprisingly well. We were awoken a few times by the Wombats but most of my lack of sleep was from the obsessive need to check on the guys to make sure they were still breathing. Occasionally I would poke at one of them if I thought they were too still which would result in them waking up and being annoyed with me. I bet that didn't happen to them in the NICU. When we woke up for the final time this morning Elliott's hat had migrated off of his head and was completely covering every inch of his face. This gave me a panic attack but it turns out he was okay! I will never put a hat on either of them before bed again. There was no more putting it off, I had to go grocery shopping today. Mostly just to buy foods to keep me, Jen, and her mother alive so that we could keep the guys alive. While I shopped, Jen and Grandma watched the boys while Jen explained the finer points of the Tour de France to Jen's mum. I found some really nice cod at the fishmonger and I used the leftover zucchini fritter mix from last night to make a crust. This is a pretty old trick from just about any time I make potato pancakes. 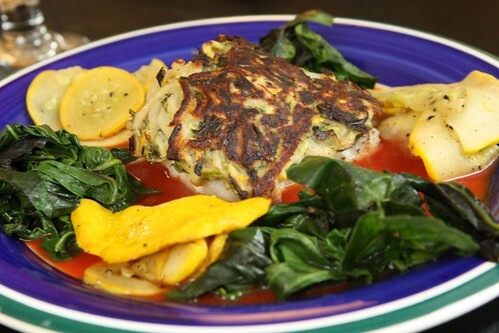 It uses up the batter nicely and is great match for cod. I also sauteed up some farm spinach with garlic, as well as the remaining zucchini, and served it up in a tomato reduction. This is an old standard from my restaurant days but it just never gets old when there is leftover pancake mixture of some sort. This rose was recommended to me a while back when I asked for a recommendation for Jen. I had planned on having a nice bottle ready for her when she could finally have some wine. 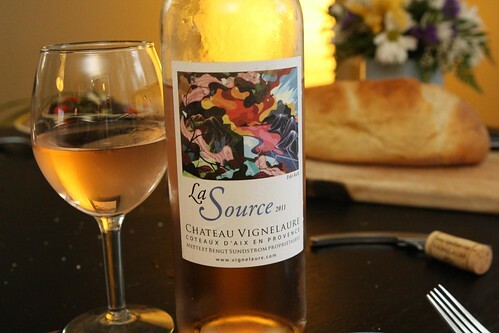 This 2011 rose from Chateau Vignelaure was fantastic. I only had a sip but it was great for a nice hot day in the comfort of your air conditioned apartment when you know it was 96 degrees outside. 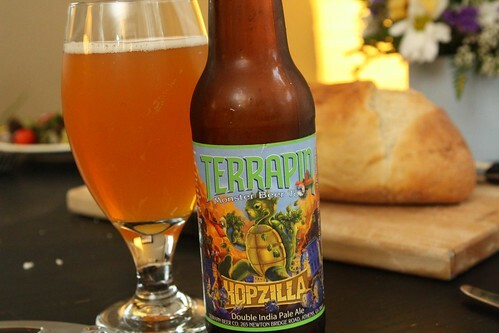 For me, I chose this Hopzilla from Terrapin Beer Company. This was a 10.3% ABV double IPA and a fine accompaniment to this seafood dinner. I was wildly impressed with this. It had a nice full body and did not taste nearly as alcoholic as it was. It was also a great prelude to baby bath time! Mommy washed Elliott tonight, paying extra attention to his hair. Both the guys were starting to get a little rank so it was high time we bathed them. Before Jen took care of Elliott I gave Martin his sponge bath. Here's the one picture of the batch where he doesn't look like he is thinking up ways that he will one day repay me with murder. And, after one full day at home, the hamper is just about full. At the moment Martin is going through clothes at a bout a five-to-one ration over Elliott. Now that I'm fastening their diapers so tightly that they are pretty much airtight this should be a problem of the past. With Elliott doing his best to take himself off our feeding schedule it's going to be an interesting night. At least there'll be no hats to scare the crap out of me in the morning.